The Escalante River Granaries are both located within a quarter mile of the Escalante River trailhead. Anyone interested in Ancestral Puebloan ruins will find the granaries very easy to get a glimpse of. Travelers through the area that don't have the time for any of the longer hikes may be able to manage the 30 minutes or so that it takes to view the granaries. This post continues past the second granary for almost another mile to the first river crossing before turning around. 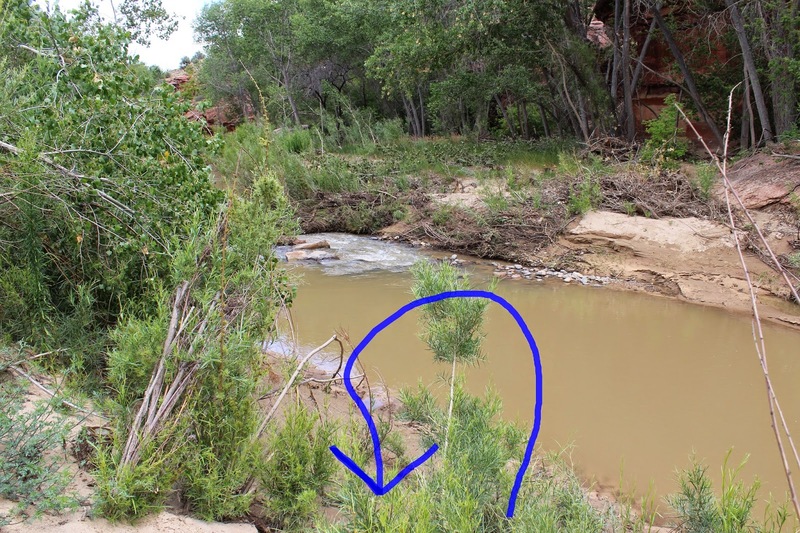 The Escalante River trailhead is at the point where Highway 12 crosses the Escalante River about 13 miles south of Boulder, Utah or 15 miles north of Escalante. Hikers coming down the Escalante River from the town of Escalante normally have a vehicle waiting here for them or else they might hitchhike back to town. 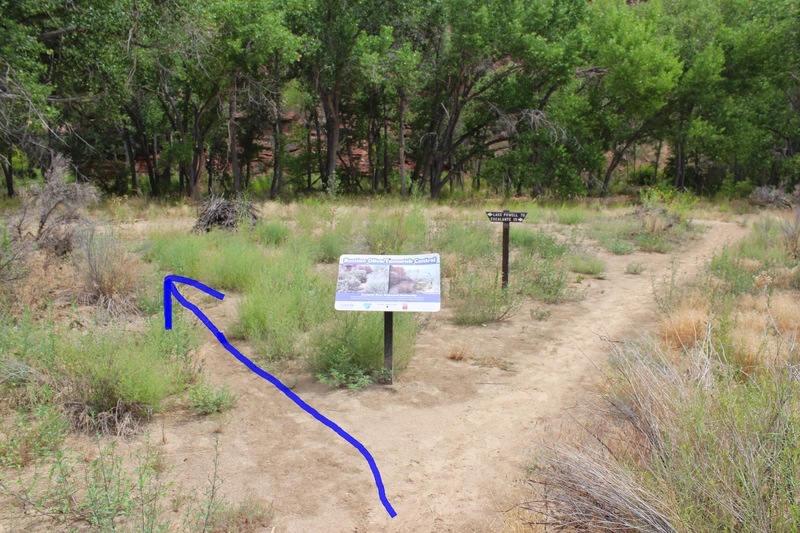 This is also the trailhead for the Escalante Natural Bridge and the 100 Hands Pictographs. As you depart from the trailhead take the route to the left heading downstream or back toward the highway. The first granary is tucked away in an alcove in the cliff on the south side of the river. The view is somewhat obscured by the trees in the summer. One of the best viewpoints is near the highway bridge. Follow the trail under the bridge to get to the second granary. The land on both sides of the bridge is private so be sure to stay on the trail. The second granary is located in the south facing cliff a short distance from the highway. The manner in which this granary was constructed is obvious due to its decay. Some granaries are built entirely from mortar and stones and we have also seen ones composed of nothing more than caliche. The main objective is to keep them high and dry and rodent proof. In some locations they might be only accessible with ropes and ladders. If time permits the trail that follows the river downstream has several picturesque scenes that hikers should find enjoyable. At times the water in the river can be quite low but thunderstorms upstream can cause it to quickly rise as much as 4-5 feet. Note the debri on the opposite bank that was deposited by a flash flood. Flash floods can occur almost daily during the monsoon season in July and August. The water usually returns to normal levels within an hour after it peaks. The area around the Grand Staircase-Escalante National Monument has been inhabited for thousands of years. The granaries along the Escalante River are like an echo from a long lost civilization. Be sure not to disturb them in any way and to report any vandalism or suspicious activity like digging. If you would like to see them for yourself then all you have to do is 'Take a hike'.